FOR IMMEDIATE RELEASE – September 28, 2018 – Washington, D.C. – The American Childhood Cancer Organization (ACCO), the soleU.S. 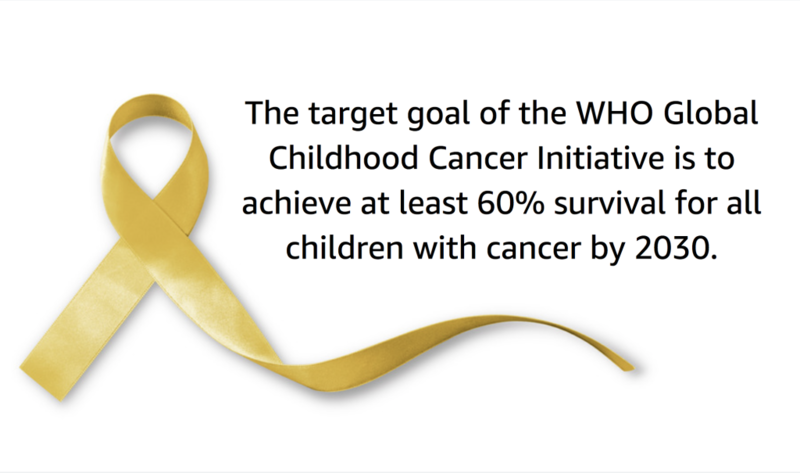 member of Childhood Cancer International (CCI) provided its overwhelming support today for the World Health Organization’s (WHO) announcement of its new global initiative to address the disparity between childhood cancer survival in low-middle versus high-income countries. The announcement came at the United Nations (UN) General Assembly’s side-meeting on childhood cancer which was organized by the Missions of the Republic of Uzbekistan, the Hashemite Kingdom of Jordan, El Salvador, the Republic of Moldova, the Kingdom of Morocco, the Republic of Philippines and the Russian Federation. Funded through a generous donation from St. Jude Children’s Research Hospital, the WHO Global Initiative for Childhood Cancer partners with national and international *stakeholders including CCI to provide leadership and technical assistance to support governments in building and sustaining high-quality childhood cancer programs. Each year, more than 300,000 children ages birth to 19 years are diagnosed with cancer around the world. Approximately 8 in 10 of these children live in low and middle-income countries where their survival rate is often near 20%. This is in stark contrast to high-income countries, where cure rates exceed 80% for many common childhood cancers. How urgent is this global initiative? “Childhood cancer is the number one non-communicable disease (NCD) cause of death in children globally,” said Ruth Hoffman, ACCO’s Chief Executive Officer, and President of Childhood Cancer International. “Childhood cancer has no borders. Why should childhood cancer treatments and cures? Even in the U.S. the majority of children with cancer continue to be treated with old drugs that were developed in the 1950’s, ‘60’s and 70’s. These drugs cost very little yet are too often unavailable to the majority of children with cancer in the world who happen to live in low to middle income countries. With increased access to essential childhood cancer medicines and radiation, children can be cured of their disease regardless of where they live in the world.” Ms. Hoffman will continue to represent the voice of the families of children with cancer as a member of the WHO Global Initiative for Childhood Cancer. The American Childhood Cancer Organization was founded in Washington, D.C. in 1970 by parents of children and adolescents diagnosed with cancer to advocate for their needs and support research so every child survives and leads a long and healthy life. The U.S. largest grassroots organization at the forefront of the crucial battle against childhood cancer, the ACCO is dedicated to shaping policy, supporting research, raising awareness and providing educational resources and innovative programs to children with cancer, survivors and their families. Since its inception, the ACCO has helped support more than half a million families affected by childhood cancer. ACCO now has 35 local ACCO affiliates known as Founding Hope chapters throughout the United States. www.acco.org. FOR MORE INFORMATION OR TO SET UP AN INTERVIEW: Contact Ruth Hoffman, Chief Executive Officer, American Childhood Cancer Organization and President, Childhood Cancer International. rhoffman@acco.org; 202-262-9949.